Wow!! Have I been missing in action...I even missed a Tool Time last week. Our holidays were so spread out, they lasted for 2 weeks with family members coming in at different times, from different states. We had such a beautiful Christmas and we just love it when we can see the whole family. I hope all of you had a wonderful Christmas and a very Happy New Year too. No resolutions this year for me, just "I hopes". I hope to organize my blog, I hope to start a sewing project this month, I hope to catch up on emails, I hope to... You all know what I mean...right? This week's Tool Time title is "You Conduit" (con du it). 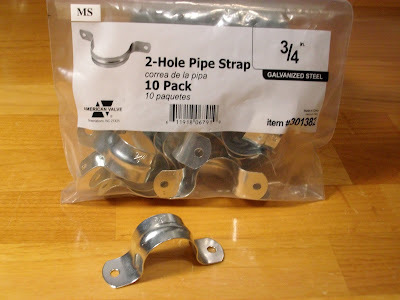 You know I love the play on words, especially when I can use a word from the hardware store. Remember this picture below? 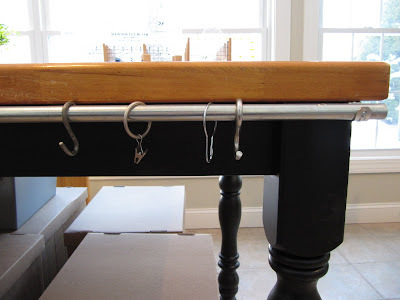 I used these conduit pipe straps to make handles for everything in my new sewing room. Well, this is a picture of the conduit pipe in my basement. 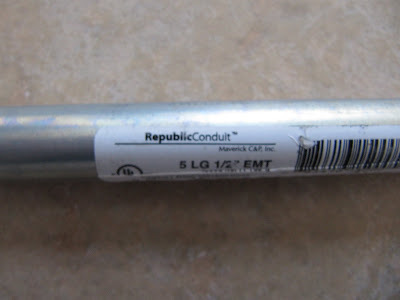 Conduit is found in the electrical section. Electricians run the wiring through them into the electrical box. The straps that I used for the handles are what hold the pipe to the wall. This is a close up of the label. If you know the measurement of the pipe you need, I'm sure the store could cut it for you...or the man in your life might have a pipe cutter. That thing spins around the pipe and cuts it as you tighten it. I need to steal that from my husband...he'll never miss it!! Here is another crooked picture...sorry. 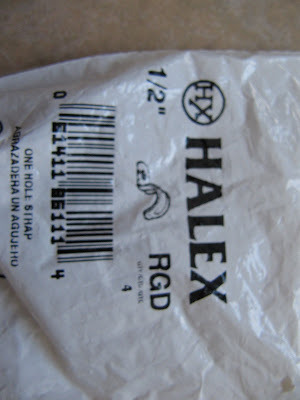 This is a shot of the bag of brackets that I used to hang the conduit pipe. 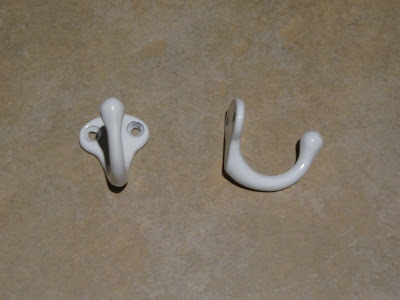 They are in the same section as the pipes and the other handles that I used. 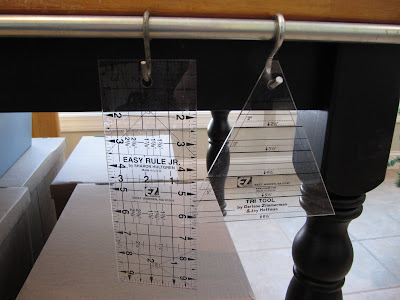 This style is perfect for where I want to mount it...under the edge of my sewing table. If you are mounting yours some where else, you may need a different style. 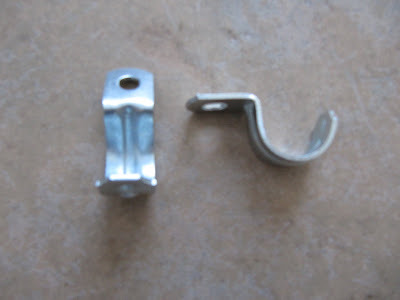 You can also use hooks like these, or small curtain brackets. I placed the bracket under the edge of my cutting table. Pre drilled a hole, then screwed it in tightly. this is a shot from underneath. Now just place your conduit pipe in the holder. 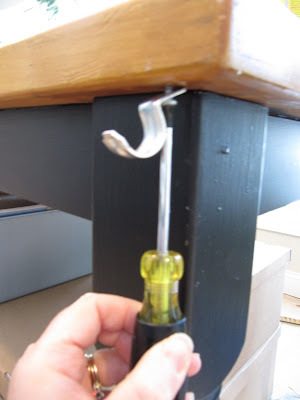 You may need to place some sort of stopper or finial on the end to prevent it from slipping off the bracket. I used 1/2" pipe caps from the plumbing section. You could always just hot glue it in place, you just need to make sure all your rings (which I mention below)are on before you glue it. 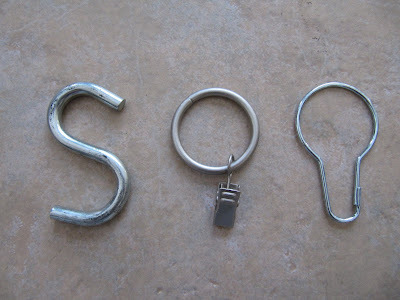 The "S" hooks aren't a problem, because the just hook on. I used all the hooks here in this picture just to show you, but it all depends on where you might hang your pipe. Mine is on the front of my cutting table. So I used the "S" hooks to hang my rulers. photographs, children's art work, telephone numbers, recipe cards, fabric swatches, inspiration clippings for quilts you want to make, grocery lists, chore charts, report cards...the possibilities are endless. Here it is on the front of my table. Just make sure no matter where you mount it, that there is enough space on the back side of the pipe for the hooks to slide back and forth. You don't want it mounted flush to the surface. Here's an extra idea...wouldn't this conduit pipe make great curtain rods for either the country galvanized metal look or the urban industrial look. Soooo much cheaper than a real curtain rod and they come in different widths too. Go take a peek in the electrical aisle...you'll be there a while!!! When the nice man from the hardware store keeps asking you if you need help as you're standing there looking at all those bits and pieces, just tell Karen sent you...he knows who I am! I also want to let everyone know that a give away is coming soon. My one year blogiversary is January 14th!! Woo Hoo. I don't know what the prize will be, but stay tuned for more info. ps. maybe some day I'll post something I've sewn...this is a quilting blog after all! These are such great ideas, Karen! Especially for the rulers. It's so funny. On Thursday the 31st I helped out with the inventory counting in our local hardware store (right across the street from us!) and I counted bunches of these! Didn't know that's what they're called. How clever! Thanks for sharing this great idea! Happy New Year,Karen!! Good to see you back and true to form with Tool Time Tuesday. Another brilliant one. Honestly you must not sleep at night. Your mind must just race with ideas. Keep them coming! I love that idea........but I'd have to mount it on the wall as I don't have a table (or a room arrangement) that would allow me to do it that way. I do like your way better, though. You are a certifiable dang genius, Karen! Have you figured out a way to stay warm? Karen, just wanted to compliment you on your clear directions. Anyone could follow your tool time ideas with no trouble. Thanks for the great ideas! Thank you for sharing your clever ideas with us. I love using simple things rather than the expensive ones to get the same result with less cost. You just make me smile! 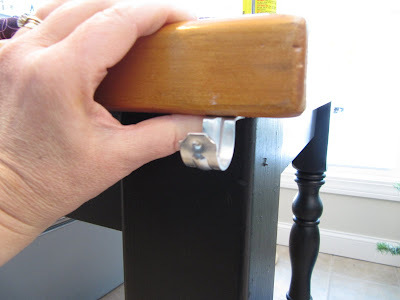 Love your blog because it combines my two most favorite things, working with tools and sewing. I am just learning to quilt although I have sewn for at least 50 years. I am loving it so far. 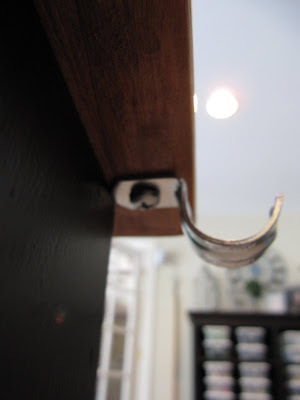 I have remodeled many houses over my life time and I just love your creative use of hardware items. I guess I was always in a hurry to find my parts and get back to the job because I didn't really think to stop and dig through the shelves and little parts. Thanks for your ideas and for slowing me down in the hardware store. Your ideas never cease to amaze one. This one is great. Love this idea! I'm re-making a bedroom into a sewing room/office I think several of your ideas may find a home there. I hope someday you put all these ideas together into a book! You could just do a pdf book! Another super clever idea, Karen! I just love it! This would also be an easy way to hang a curtain around the table to hide what's underneath! I just skimmed the article so you may have mentioned that already...I'm expecting company any minute! I'll be doing a giveaway soon too for my 500th post, and I'll be keeping an eye out for yours! Very punny title and the idea is great! I'll need to find a place to use one of these. Karen, You've done it again! LOVE this idea! I can easily do this to my table!! I have run out of wall space so this would be perfect! Also I have to thank you again for the gift you included in my I spy fabric. I use it ALL the time travelling. I have tied it onto my computer lapboard (I use this to hand sew on) I have tied on my scissor and use the little pocket to put my thimble in!! Make my sewing life so much easier!! Thanks again! Glad your holidays were wonderful! 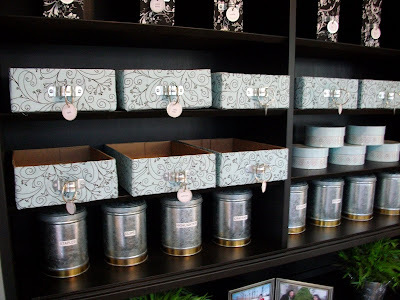 Love these ideas...the handles on the boxes...just genius! Thanks again as always for sharing your great ideas! WOW what a great idea! I just love all your tool and hardware ideas! What a great idea! I don't know how you keep coming up with all these wonderful ideas. Thanks for sharing! see it but it was snow. I love it and the play on words - just cracked me up! Great idea. Before I read through the whole thing, I was thinking "curtains"! Yes, much cheaper and such a cool look! You're a doll for sharing! 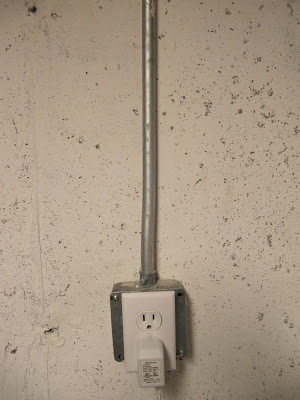 You have solved a homemade need for me with using this conduit! I saw on a blog....could have been yours....an idea to hold width of fabric or quilt top up on a roll to pull down to the pressing table. 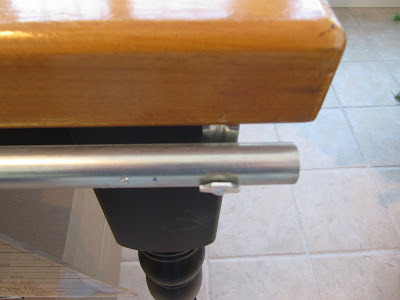 Hard to explain....but I needed a "dowel" longer than 4 feet (I can't find one) to fit inside a pool noodle (those floaty things for swimming pools) to hang the noodle on brackets above my pressing table. The conduit will work! And probably cheaper! 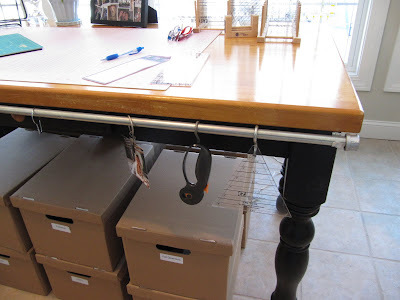 You could also hold your wax paper rolls or fusible webbing for easier access as well. Great idea Karen. Glad to hear you had a wonderful Christmas season with your family. Recently I came across your blog and just read your bio. Everything, except our names, are the same. Although after seeing your pictures, your sewing room looks a lot cleaner than mine. I am having fun reading your blog-I love your ideas! Well there you goooo again girl! You CONDUIT..VERY CLEVER. My Ace Hardware guy knows me (and you) by name now. 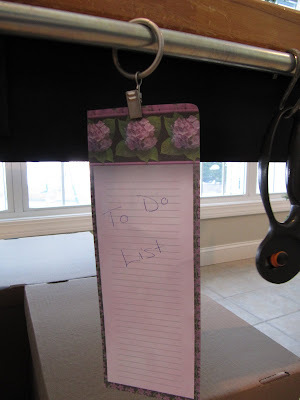 What a clever idea, this could be a quilt hanger for a wall hanging on a wall as well. You could also get creative and paint it black, brown, white, etc. 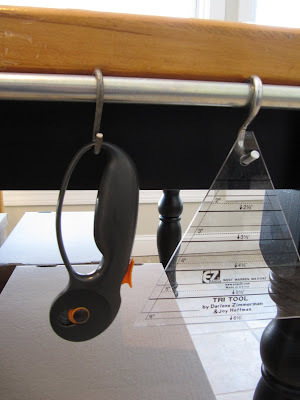 What a clever and useful idea -- thanks for sharing! Another great idea - thanks! What an awesome idea. Great way to maximize minimal space. Great ideas! Thanks for sharing! 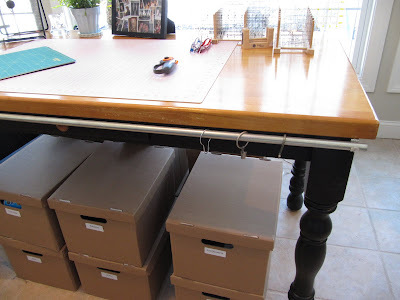 I always love to see organizational ideas for craft rooms! Brilliant! I am sew glad I stumbled onto your site. Your ideas are very clever. Thanks for sharing with us. About your pictures showing up sideways, it's not picasa, it's blogger. When you edit your pictures and flip them, blogger gets confused. It's better to flip them in the film strip viewer before you edit them. I hope this makes sense. Of course it's possible you already know this by now. Have a wonderful weekend! Now, where is that "follow" button? You & I are 2 peas in a pod. I am well known @ my Home Depot as well. They told me recently to just put on an apron, as I tend to help little old people find what they are looking for. Since my husband is an electrician & builder I find all the building materials to be fun to work with. I recently donated a "wine hive" which looks like it would have been perfect in place of your "french drain" pipe. The pieces were wine bottle length, & diameter, perfect for yarn. 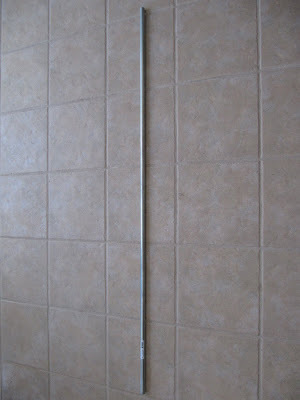 Your suggestion of conduit as curtain rods is a good one (I have used it before, where you need strength & length). I also recall another trick (cheaper yet) I once used...white 1" to 1.25" diameter PVC pipe (only for short runs & lightweight). 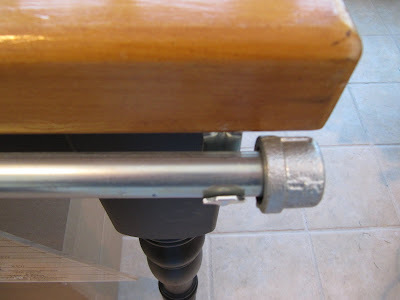 Use (2) PVC pipe caps & (2) PVC 90 degree elbows, your length of PVC pipe needed + about 10" extra. It doesn't even require glue & holds just dry fitting. I screwed the pipe caps to the wall, but you might try the command strips instead. Best to pre-assemble, then mark the wall for centerline & level. Worked great for valances in the bathroom & kitchen windows. I am a follower of your blog now. Thanks for all your ideas. 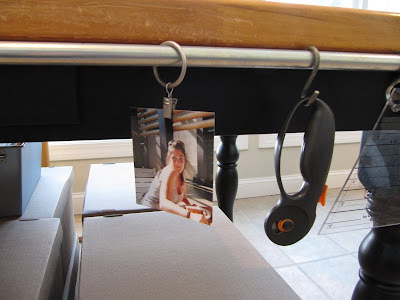 I recently saw an idea to hand a towel bar in your closet with rings to organize scarves. I think I like the pipe better - can customize the size and does not stick out so far from the wall!!!!! Thank you! Electrical conduit provides very good protection to enclosed conductors from impact, moisture, and chemical vapors. Varying numbers, sizes, and types of conductors can be pulled into a conduit, which simplifies design and construction compared to multiple runs of cables or the expense of customized composite cable. You are very creative and inspiring. Thank you so much for sharing your ideas !